Delta throws birthday party for member of first flight attendant class as she turns 102. The year was 1940. World War II entered its second year. U.S. President Franklin D. Roosevelt was running for a third term. And Sybil Peacock Harmon, a vibrant, 24-year-old nursing school graduate, was hired by Delta Air Lines into its first class of stewardesses, today known as flight attendants. 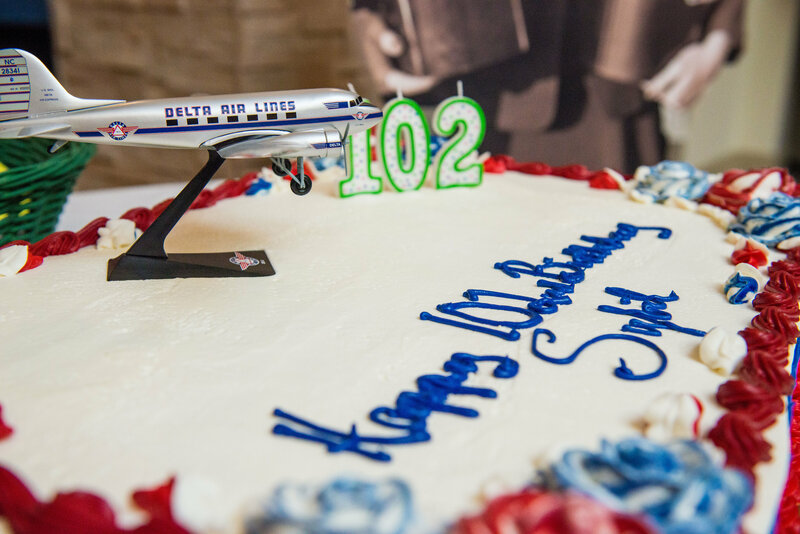 Seventy-eight years later, the airline visited Sybil at her retirement home in Acworth, Ga., to celebrate her service to Delta on her 102nd birthday. Surrounded by her friends, daughter, Patricia, and her Delta family — including two of the airline’s newest flight attendants — Sybil celebrated a life filled with travel, service and unforgettable memories. The party kicked off with Allison Ausband, S.V.P. — In-Flight Service, presenting Sybil with an orchid, a Delta tradition started by founder C.E. Woolman, who grew orchids and gave them to employees on special occasions. Allison also pinned Sybil with a new set of flight attendant wings. 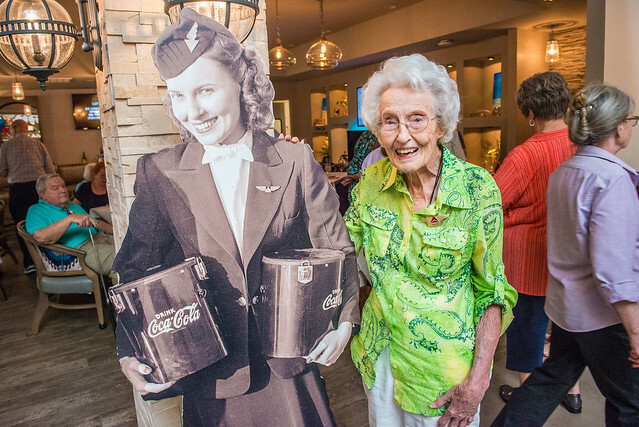 The party included a display of Sybil’s original flight log books, an authentic 1940 stewardess uniform and a life-size cutout of an iconic Delta photo featuring Sybil from a marketing photo shoot in 1940. Delta began planning Sybil’s birthday celebration after a chance encounter between a customer and a current flight attendant. Don Fries, a fellow resident at Sybil’s retirement home, was visiting his son when he brought up Sybil’s former aviation career. His son found her famous photograph on the Delta Flight Museum website and sent it to Fries for confirmation. “I showed it to Sybil and she said, ‘That’s me!’ She had a tear in her eye,” he said. On his next flight, the son told flight attendant Kevin Jennings, who contacted the Delta team. A phone call revealed that Sybil would be celebrating a monumental birthday in just two weeks. “It was like somebody up there put everybody together at the right time for Sybil,” Fries said. Sybil flew for Delta from 1940 to 1943, primarily working on the 21-seat DC-3. As a stewardess, she was required to be a registered nurse. Her memories of her aviation career include serving in-flight boxed meals of fried chicken, potato salad and a Coke, and giving out chewing gum to passengers due to the lack of pressurization in the cabin. Sybil recalled that during World War II Delta flew many young pilots back to their bases after they had ferried war planes to North Africa. In 1943, Sybil left Delta to join the war effort, eventually being promoted to First Lieutenant. Three years later, she left the service and married U.S. Army Capt. Wallace Harmon, a former Delta reservations agent who re-joined Delta and spent most of his career as a District Director of Traffic and Sales in Dallas. Their daughter, Peggy, also worked as a Delta flight attendant from 1973 to 2008. 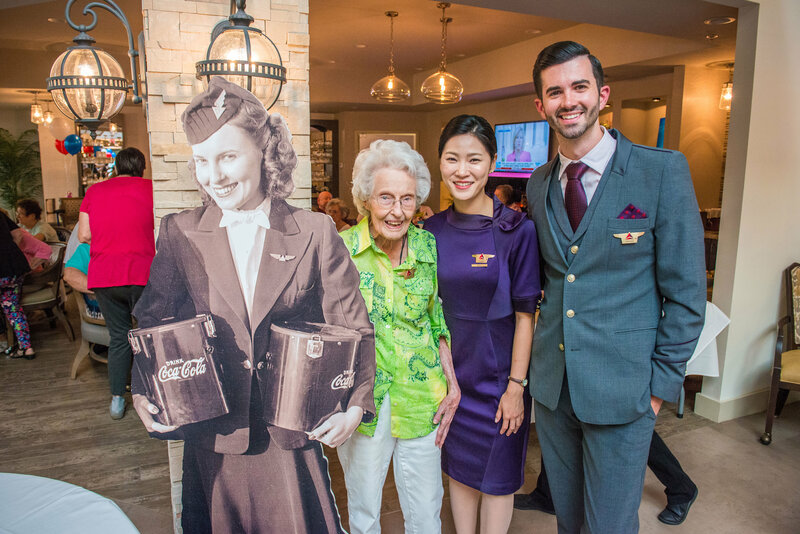 Decades later, Sybil remarked on the two young flight attendants who helped her celebrate her 102 years around the sun.